Working from home – for some, it’s a dream come true, for others it’s a nuisance that makes work harder. Nearly 3.3 million Americans telecommute to work full-time – and this trend is only growing. Thanks to the constant change and advancement of technology, it’s easier than ever to take advantage of working remotely. The reasons for working remotely are as varied as the jobs: perhaps you want to spend more time with your family, or you live hundreds of miles away from the office, or maybe you’re just out of town for a conference. There’s no doubt about it, telecommuting allows for more flexibility and freedom. However, to truly maximize your potential as a remote employee, you should take advantage of the communication and organizational tools available to you, including conferencing, organizational, messaging, and file-sharing apps. Video conferencing is often used to conduct meetings and presentations, as it allows remote workers to see and hear the same content as those present, in addition to being seen and heard themselves. We’ve highlighted three of the most useful conferencing tools for the easiest communication and sharing. UberConference is primarily an audio conferencing tool with some additional visual features. The program runs online through any computer, and allows you to schedule and run calls. Remote participants can join the conference by calling in to the given number without needing a PIN, using the mobile app, or logging in online. To take advantage of the visual features, you can use your computer or the app. You can view icons indicating who is currently speaking and share your screen with others, though there is no built-in video feature. The ease of using UberConference is its biggest selling point. Calls can easily be scheduled, don’t require PINs, and can be accessed on the go, though the lack of video is a drawback. The free, basic version provides unlimited calls, though the $10-per-month Pro plan is needed to access all the features. Highfive provides users with a camera and software specialized for video conferencing. The camera has a built-in microphone and is installed over a TV in the main meeting room, allowing all parties to see each other. During a conference, the video automatically switches to whoever is currently speaking, making it easy to see who is talking. Because Highfive is web-based, each remote call member is sent a link to connect directly to the conference through their smartphone, tablet, or computer. 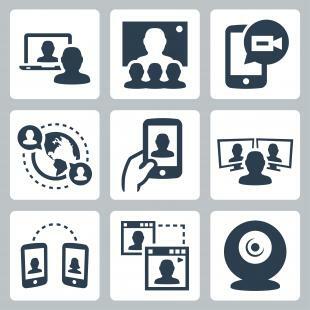 The video conference is managed through your own mobile device or computer. Highfive is a great tool for video calls. It’s simple to use and provides excellent video and audio quality, in addition to easy screen sharing for presentations. However, calls are limited to 10 participants and the product is significantly more expensive than the other options listed here, at a cost of $1,199 per room. Arguably the most popular web-based tool for video calls, Google+ Hangouts is a simple way to connect with remote workers. Google+ Hangouts runs in your browser, through the mobile app, or through the desktop app. Both local and remote conference members easily join the call through the provided link, using their own webcam for video. Similar to Highfive, the program automatically switches the video to whoever is currently talking, and messaging and screen sharing are also built in. Although there is a free version available, the professional version is included in Google Apps for Work, which costs $5/month per user. This suite includes business versions of Calendar, Gmail, Drive, and a handful of other apps. The benefit of this is that everything is easily synced – you can schedule a meeting on Calendar and the Hangout link is automatically provided for everyone. However, one drawback is that the calls are limited to 15 users. Choosing the best tool for you and your company can be difficult. If you’re trying to cut costs, UberConference and Google+ Hangouts are good choices. Google+ Hangouts is ideal if your company uses the suite of Google Apps for Work, as everything is seamlessly integrated. If quality and ease-of-use is your priority, Highfive may be the best option. There are numerous other factors to take into account before investing in a conferencing resource, and countless other options not listed here, so take your time and do some research before choosing your conferencing tool. Going beyond just the technology, OpenSesame offers many courses on managing and communicating with remote workers. For more, check out Inspiring and Motivating Remotely or the Project Management and Virtual Teams bundle, or browse through the courses in our Remote and Distributed Teams category.